Mario Livio is an internationally known astrophysicist, a bestselling author, and a popular lecturer. He is married to Sofie, a microbiologist, and they have three children, Sharon, Oren, and Maya. Below you can find information about his most recent book,”WHY? What Makes Us Curious”. The book discusses human curiosity and its mechanisms, and it includes interviews with exceptionally curious individuals. You can read Livio’s blog posts on the Huffington Post, follow him on Twitter at @Mario_Livio, or drop him a line on Facebook at Mario Livio. WHY? discusses all aspects of human curiosity. A Few Takeaways from WHY? 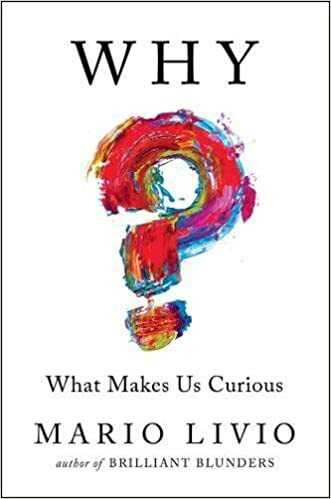 Livio identifies four different kinds of curiosity, which activate different parts of the brain, and he explains their significance. For example, the curiosity triggered by novelty, surprise, or puzzling stimuli (“perceptual” curiosity) is different from the curiosity that embodies our love of knowledge (“epistemic” curiosity). Recent research suggests tantalizing connections between curiosity, memory, and learning, as well as an overlap between the brain circuits of curiosity and reward. Studies show that the desire to learn produces its own internal reward in the brain, and when curiosity is piqued, people learn more readily and retain information better. Leonardo da Vinci: Unparalleled artist and scientist who left thousands of pages with notes and drawings, but who also may have suffered from ADHD. Fabiola Gianotti: Renowned particle physicist, Director General of the European Organization for Nuclear Research (CERN), who led one of the teams that discovered the Higgs boson, but who is also a passionate musician. Brian May: Virtuoso guitarist of the band Queen, accomplished astrophysicist, and vocal activist for animal rights. Marilyn vos Savant: Who has the world’s highest recorded IQ, and is author of the “Ask Marilyn” column in Parade. John “Jack” Horner: Prominent paleontologist and science advisor to the Jurassic Park movies, despite never getting a college degree. There’s a compelling case for the beginning of cooking as a turning point in the rapid evolution of the human brain, and by extension of human curiosity. Conversely, curiosity probably played an important role in the discovery that cooking can soften raw food, make it easier to digest, and improve its taste. Though nearly impossible to track the precise emergence of language, it appears quite likely that the evolution of the unique human curiosity (the ability to ask why?) and appearance of the distinct human language were strongly correlated. Socially shared myths, rituals, and symbolism were most likely the first sophisticated responses to the nagging why and how questions and were therefore the fruits of curiosity. The feedback between curiosity and language turned Homo sapiens into a powerful intellect with self-awareness and an inner life. Whether by religious orthodoxy or oppressive rulers, guardians of the status quo have historically discouraged curiosity to keep their subjects inferior in knowledge. We see the legacy of the myths about the “dangers” of curiosity even in traditional fairy tales like Hansel and Gretel and Sleeping Beauty.